The Passover story may be a bit hard to summarize. That’s probably why, every spring, we spend a very long dinner retelling it! But if you’ve ever struggled to explain the holiday to a non-Jewish friend or relative (or, perhaps, you ARE that non-Jewish acquaintance! Welcome! ), or needed a short version to tell your kids before diving in a bit more deeply, we’re here for you. We bring you two brief explanations: one covers what the holiday is all about, and the other is a super-abbreviated version of the Passover story. So what’s Passover all about, anyway? We eat unleavened bread, or matzah on Passover because when the Jewish people were in a huge rush when they fled Egypt, and didn’t have a chance to let their bread rise. Here’s the gist of the Passover story. The Jewish people were slaves in ancient Egypt. The Pharoah, the ruler of Egypt, was worried the Jews will one day outnumber him and revolt, so he commands them to throw their firstborn sons into the river. A Jewish woman, Yocheved, puts her baby, Moses, into a basket in the river. 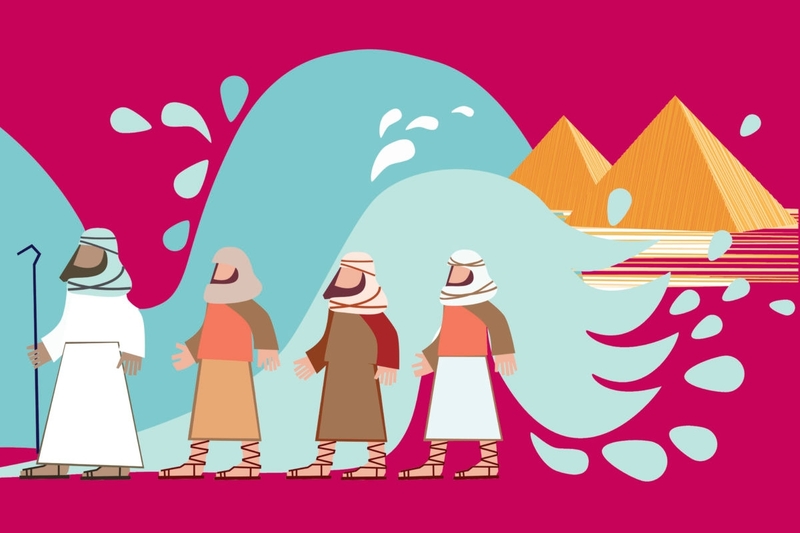 Moses floats to Pharaoh’s palace, where he is adopted by his daughter. One day, however, Moses discovers that he’s a Jew, and makes it his mission to help free the Jewish people. He asks Pharaoh to let his people go, and when he refuses, God hits Pharoah with ten terrible plagues. The 10th plague, the killing of all Egyptian firstborns, is the deadliest —but, thanks to a special sign, the deaths pass over the houses of the Jews, hence the name of the holiday. After the horrible 10th plague, Pharaoh momentarily agrees to let the Jews go. They rush out before he changes his mind, quickly grabbing all the food and possessions they can, which is why their bread doesn’t have a chance to rise. Sure enough, Pharoah changes his mind, and send his army to bring back the Jewish people. That’s when God performs another miracle: he parts the Red Sea especially for the Jewish people, letting them get through. The Jewish people march through the desert for 40 years, before they finally reach the land of Israel. Want a slightly more in-depth version? Read this great retelling of the Passover story for kids, and don’t forget to get the Kveller Haggadah, for the ultimate deep dive.